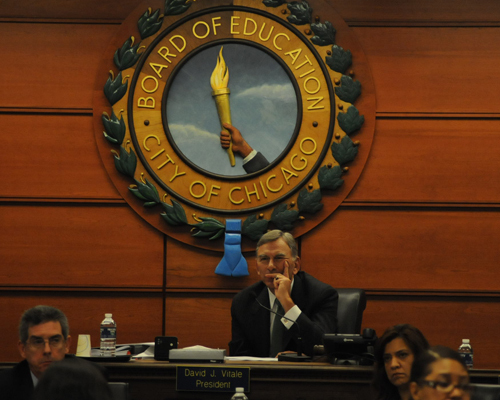 CPS standardized testing program is excessive and experimental, and just how expensive? 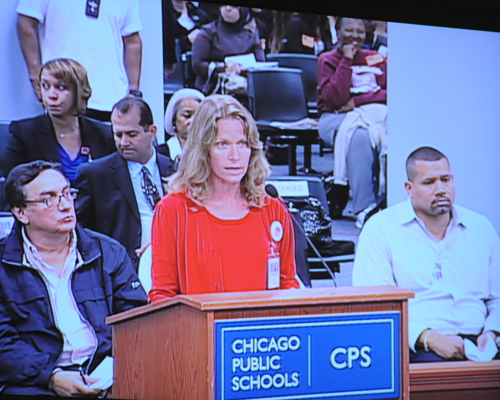 With the intention of alerting the public to the problems with the CPS testing program and to obtain Board financial information, this reporter spoke at the September 28, 2011, Chicago Board of Education meeting. The following are my prepared remarks, which I read, along with some of the dialogue that followed with Board president David Vitale. Explaining to the new board members that the CPS standardized testing program is excessive and experimental, Substance editor Sharon Schmidt spoke at the September 28, 2011, Chicago Board of Education meeting. "Of course your testing experiment hits our most disadvantaged students the hardest — you test our poorest students in segregated schools the most," she said. Good morning. My name is Sharon Schmidt. I am the editor of Substance, the Chicago newspaper that covers public education. I am a step-parent of a Chicago public high school graduate. My husband and I have two children who attend a Chicago public elementary school. I am a high school teacher and the chairperson of the Chicago Teachers Union testing committee. I am here on behalf of the CTU testing committee, but before I speak about testing I am going to make a suggestion about these board meetings. Why not hold the meetings during after school hours in the neighborhoods at schools with large auditoriums and free parking? It is very difficult for people to attend these downtown meetings during the workday. Many more parents and teachers would like to be here, but can't take the day off. In addition, the seats are limited here. Right now there are dozens of people who did come here this morning to attend the meeting, but since there is not enough space here they're sitting in a room on the 15th floor watching this on a video screen. Why don't you hold the board meetings as they used to be in the schools, after school, so that more people could attend? How does that sound? Vitale said something non-committal. I added, "In the past, they were every other month � sometimes here, sometimes in the schools." Then I continued with my prepared remarks. CPS is administering an excessive number of tests. Not only are you using the federal and state required tests, ACCESS for English Language Learners, the multi-test ISAT, the EXPLORE, PLAN, ACT and Work Keys (which you administer to high school students several times each year), there are other series of tests you administer multiple times a year to students, from pre-K through 12th grade. The Kindergarten Readiness Test, mClass math, DIBELS and Scantron Performance Series are common from pre-K through 9th grade, but in some schools you administer even more, such as benchmark assessments, KLT, MAP, Riverside Achieve Data, Step, and additional area-created, 5-week assessments. Our students are bombarded with tests, multiple times a year. Of course your testing experiment hits our most disadvantaged students the hardest. You test our poorest students in segregated schools the most. "We have a freedom of information request to Cassandra Daniels, and we would like to know how much we are spending on testing." Vitale responded by saying the FOIA would be answered. He added that I had made a lot of "wild accusations"� without any statistics. "Okay, here's a statistic," I said. "A kid, an average kid, by the time he hits 8th grade is going to take more than 100 tests." "My daughter is in elementary school and she's taking tests every day and it isn't a problem," Vitale said. "I don't know what you're talking about." "I'm not talking about teacher-produced tests," this reporter said. "I am a teacher. I assess my students regularly. I create tests on the unit that we are covering. Those are good tests. Those tests go back to my students. They can learn what they haven't gotten. They can see how they did, see if they are mastering the curriculum. I'm talking about corporate-produced tests � the Scantron Performance Series tests, the various iterations of the Riverside test. There are so many new tests. I just talked to a principal this morning. In addition to the tri-yearly, multiple-test Scantron Performance Series tests, he just heard from his Area that he needs to do a quarterly test. What is the point?" Vitale mentioned that CPS has an office of education and that he would talk to people there to try to find out, but it would be difficult to find the information. "Oh my goodness,"� I said. "Ask the teachers. We have asked the teachers. In our committee we have surveyed delegates in every school in Chicago: 'How many tests are you giving in your schools?' I would hope that would be among your first jobs: Find out what is going on in each school. Some of these kids, with the primary grade DIBELS and mClass math, are taking standardized tests every two weeks." 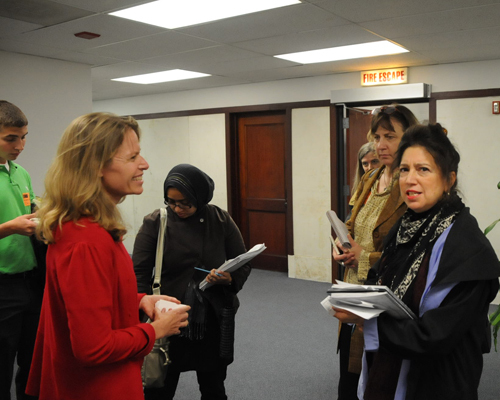 Following Schmidt's presentation, reporters followed her into the Board chambers lobby to ask more questions about CPS standardized tests. From left: Blake Williams, Medill, Noreen Ahmed-Ullah, Chicago Tribune, Suzanne McBride and Marla Donato, Columbia College journalism, and Rosiland Rossi, Chicago Sun-Times.